If memes can be compared to snowballs (Shifman, 2013) then Trump’s “covfefe” tweet was a major snowstorm - an event that catalyzed widespread meme production, of different kinds, both on a formal and on a content level. Generally speaking one may conclude that Donald Trump tweets and speaks in meme fodder. ‘Meme’ is a container concept, which encompasses a wide multitude of different making cultures and preferred formats. Further categorization is needed. Based on digital analysis with ImageSorter and Clarifai, as well as human analysis, we distinguish four categories (carteme; photo of human overlaid with text; text integrated in logo/cup/t-shirt/billboard; fake screenshots). Back in the day – not so very long ago – political leaders were the objects of political cartooning. Being made fun of in political cartoons was the price one paid for power, and this was not seen as something that politicians in a democracy could or should influence. However, Donald Trump seems to have changed that dynamic to some extent, aided by the social media paradigm in which he operates. Trump seems to have managed to change the classical dynamics of political cartooning in his own favor. A great deal of political cartooning and meme-making of and around Trump, by supporters as well as detractors, works to his advantage. Even though his own tweets usually contain only or mainly text they often imply and inspire cartoonesque image production by professionals and amateurs, which Trump and his entourage then often disseminate to their large and worldwide audience. The ‘CNN’ gif (spread initially through Reddit), in which Trump wrestles down CNN (Giphy, 2017), is a case in point. It appeared on Reddit, and Trump tweeted it, which made it world-famous. Thus, Trump’s tweets (“my button is bigger than yours”, “I’m a very stable genius”) tend to give rise to the production of cartoonesque memes, which he then sometimes helps to spread. The word "meme" was originally coined by Richard Dawkins (1976), to convey "the idea of a unit of cultural transmission", but for the sake of operational clarity, we have adopted Limor Shifman's (2013) definition: “I suggest defining an internet meme as (a) a group of digital items sharing common characteristics of content, form, and/or stance; (b) that were created with awareness of each other; and (c) were circulated, imitated, and transformed via the internet by multiple users.” In practical everyday terms, the word "meme" is often associated with a generic image of iconic quality to which a top and a bottom text has been added. This type of internet meme is usually produced with the use of meme generators, e.g. img flip, Kapwing, or Make a Meme. In coding the images with memetic content, captured in our data collection, we have used the expression meme in Shifman’s sense, particularly focusing on the idea that a meme is referential to another popular cultural text. In practice, of course, this included many memes produced by standard meme generators. Our coding classification of image types is as follows: Text, Photo, Meme, Image of tweet, Animated GIF, Cartoon, and Carteme. ‘Carteme’ here is a coinage employed to refer to cartoonesque memes, that is, memetic formats that include elements vernacular to cartoons or comics (e.g. speech bubbles, a cartoonish drawing style, or a collage including a cartoon character, such as Pepe the frog). One extreme case in point of Trump tweeting something that led to an avalanche of (often cartoonish, or at least humorous) creative production across social media platforms was his famous ‘covfefe’ tweet of 30 May 2017 (@realdonaldtrump sent off the tweet “Despite the constant negative press covfefe”), which he deleted hours later. The next morning, when “covfefe” had exploded on social media as the perfect fodder for a range of different forms of meme-ification, Trump followed up with a tweet “Who can figure out the true meaning of ‘covfefe’ ??? Enjoy!”. Thus, Trump made explicit what is often an implicit invitation in this tweets, to respond on social media in a creative way. For the project we used four data sets from May 31 2017 to January 1 2018: The first consisted of images extracted from posts on 4Chan that contained the word ‘covfefe’, but due to an unexpected 4CAT error, we only retrieved data from the week after May 31, 2017. The second data set consisted of images taken from Reddit posts containing ‘covfefe’, and finally, the third data set consisted of images from Tumblr posts containing the hashtag #covfefe. How do President Trump’s tweets inspire the production of memes and other images visualizing his words? What kind of memetic traits can we see when analyzing responses to President Trump’s ‘covfefe’ tweet across 4Chan, Reddit and Tumblr? What are each platform’s preferred memetic formats? How can we understand cartemes? Images selected from three different platforms (4Chan, Reddit, and Tumblr), using different tools for extracting links to images, including attributes like timestamps and authors. 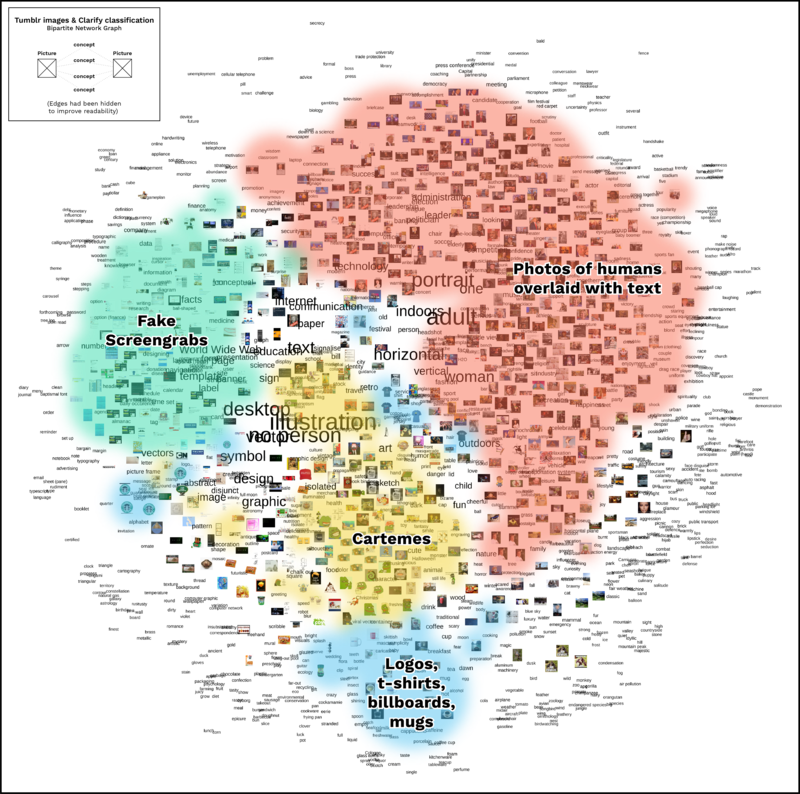 Then we retrieved the images, and based on four different types, image type, political orientation, images showing Donald Trump or mentioning Covfefe, the images were coded (see the coding matrix below for the values attributed to the images) for each platform, thus making it possible compare the images across the three platforms, as well as sorting the images using ImageSorter and Clarifai. The images on 4Chan were selected with the tool 4CAT. The query that we decided to use for the tool brought back results featuring posts that contained the word ‘covfefe’, were uploaded between May 30, 2017 and January 1, 2018 and had a thread density between 15 and 30 percent. We chose to focus on the second half of 2017 for the study because President Trump’s ‘covfefe’ tweet was sent out to his followers on May 31. The following six months were hence seen as the times in which the 4Chan community was most likely to engage with the term. The thread density, on the other hand, was chosen based on our desire to both utilize a general enough frame of reference for analyzing the online platform, all while not going overly generic with our query as to not receive irrelevant results. The output that we subsequently received had a CSV file containing 417 posts. Because 4Chan uses security measures that make it difficult to download images from the platform, the 4CAT: Capture and Analysis Toolkit (Peeters & Hagen, 2018) was used to download the pictures. After the script was run, there were 120 ‘covfefe’-containing posts left with image files within them. Because of an unexpected 4CAT error, however, the tool solely brought back results of the week immediately following the ‘covfefe’ tweet when queried. That meant that the 120 pictures extracted from the tool within this study were, while representative of the platform on the whole, were a more limited sample size of 4Chan usage vis-a-vis the data extracted from both Reddit and Tumblr. 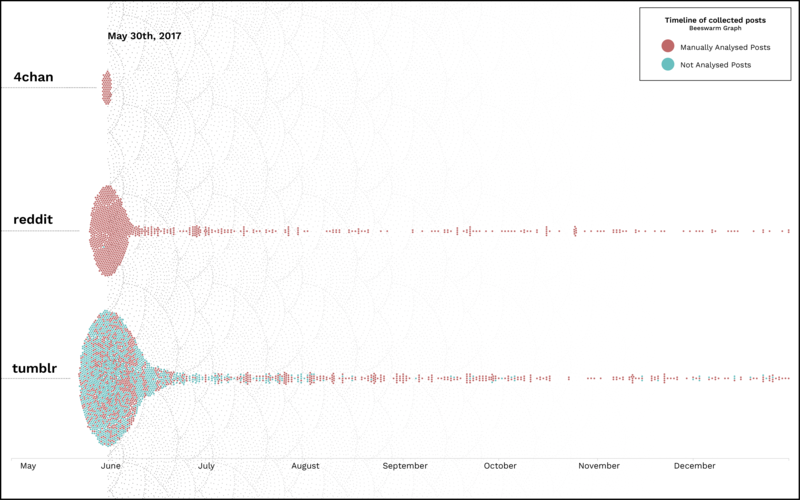 The images on Reddit were selected with Google Big Query (“BigQuery - Analytics Data Warehouse | BigQuery,” 2019), using the public data base fh-bigquery, made by Felipe Hoffa (2019). For our query, we used the data subsets fh-bigquery:reddit_posts.2017_05 to fh-bigquery:reddit_posts.2017_12. These subsets fit the time frame of the research: Between May 30, 2017 and January 1, 2018. The datasets for Reddit comments are divided in months, so we had to include the whole month of May. However, since Donald Trump only tweeted his message containing ‘covfefe’ on the 31st of May, there will not be any posts originating before this date. This query landed us 11050 results, which we downloaded in the form of a spreadsheet. Not all images connected to these posts were still accessible, for example due to posts being to deleted. We placed the urls of the posts we found in the Harvester tool (2008), in order to gain a list of useable image links. Once again, we made a spreadsheet of these, which we exported to the Image Tagging Interface for the Clarifai API. After running all the urls through the interface, and filtering out only those image links with a confidence grade of 0.9 or higher, there were 982 image links left. On Tumblr, the TumblrTool (Rieder, 2015) was used to extract posts between May 30, 2017 and January 1, 2018 with the hashtag ‘covfefe’, which were then downloaded. Afterwards, posts that didn’t contain an image-URL were thrown away. A limitation of the TumblrTool is that the image-URL just contained the first image of the post. So when there were more than one image in a post, only the first one was selected. 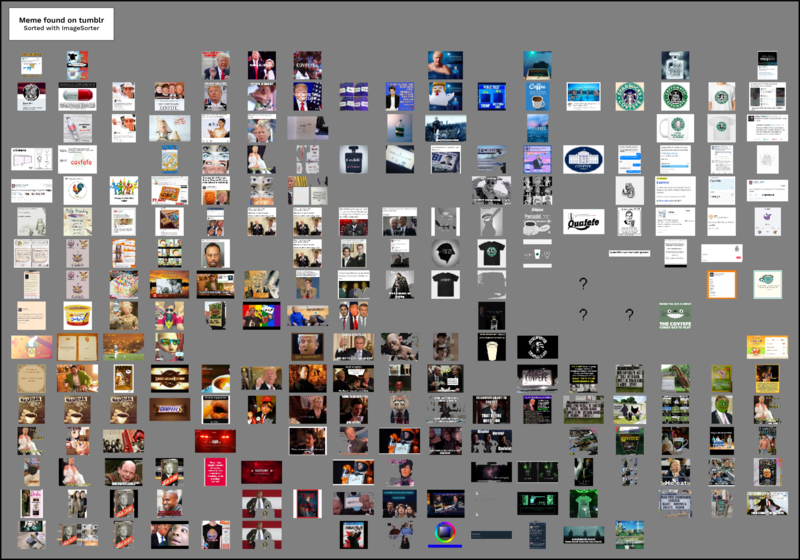 All the pictures, from the different media, were then classified through four categories that we elected to utilize within our study: the image’s visual nature (carteme, text-based, cartoon, picture of tweet, photo, meme or gif), its political orientation (unknown, pro or anti President Trump), as well as whether it directly referenced the US president and ‘covfefe’. On all three platforms, the posting pattern shows, within the collected data sets, that the main bulk of the posts were posted shortly after Donald Trump’s tweets on May 31, 2017. Then there was a very notable drop in postings the following days, and eventually there was a steady, but very limited stream of posts (see the time below for the posting patterns on 4Chan (bearing the previously mentioned limitations with the data set for 4Chan in mind), Reddit, and Tumblr. The images which were analysed and categorised are marked with "manually analysed", the others with "not analysed". In any case, all images were passed through Calrifai). On all three platforms, the most used image type is the meme, here understood as an image with text overlays, followed by photos. On Tumblr and Reddit, the third most posted image type is image of tweet, and then followed by the cartoonish memes, the carteme, and pure cartoons. On 4Chan, the order is GIFs and images of tweet. Remarkably, on Tumblr and Reddit there is a notable amount of text posts, whereas on 4Chan there is none. 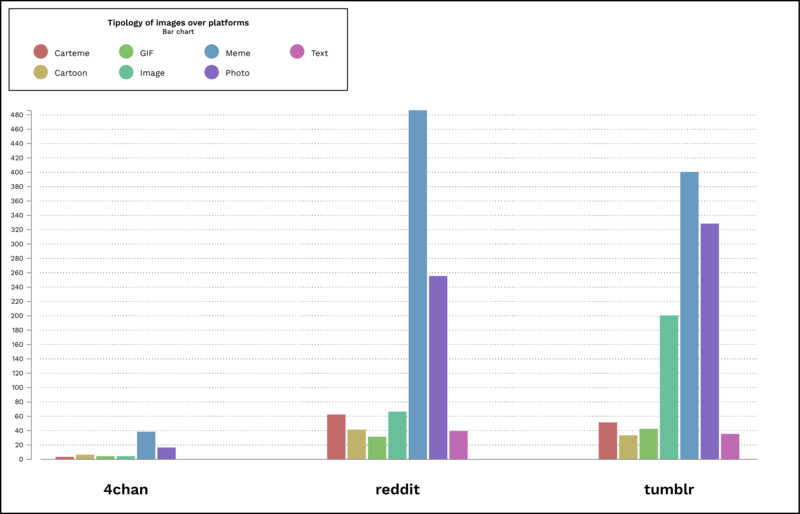 The distribution of the posted image type is seen in the graph below. Looking on how the users across the three platforms respond to Donald Trump’s tweets, there is a remarkable absence of political orientation (pro/anti Trump) in the majority of the postings. A large portion of the images were just photos, but a large portion of the images, which contained the word covfefe were made-up logos, coffee mugs, billboards, etc., images of people with text overlays, fake screengrabs, or cartemes. 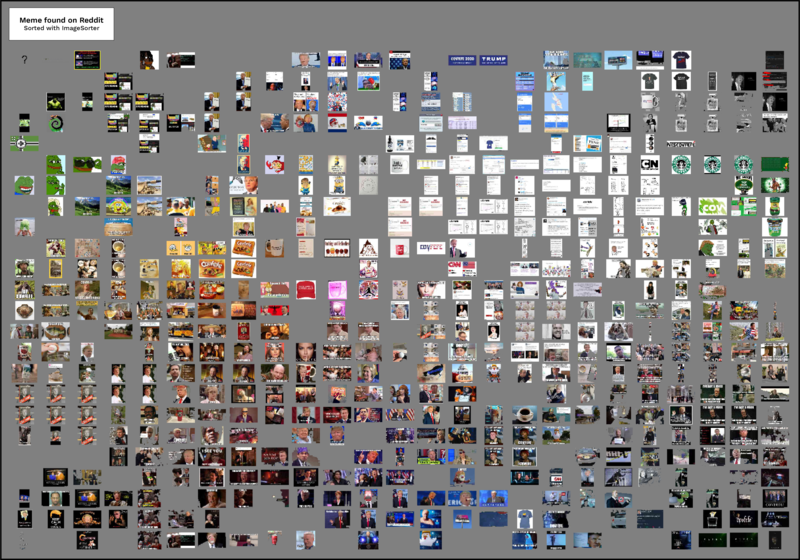 Using Clarifai to analyze memes from the platforms, yielded large, distinct groups of images. Below is a sorted Clarifai view of the posts with memes from Tumblr. Following that is the same view for posts from Reddit. 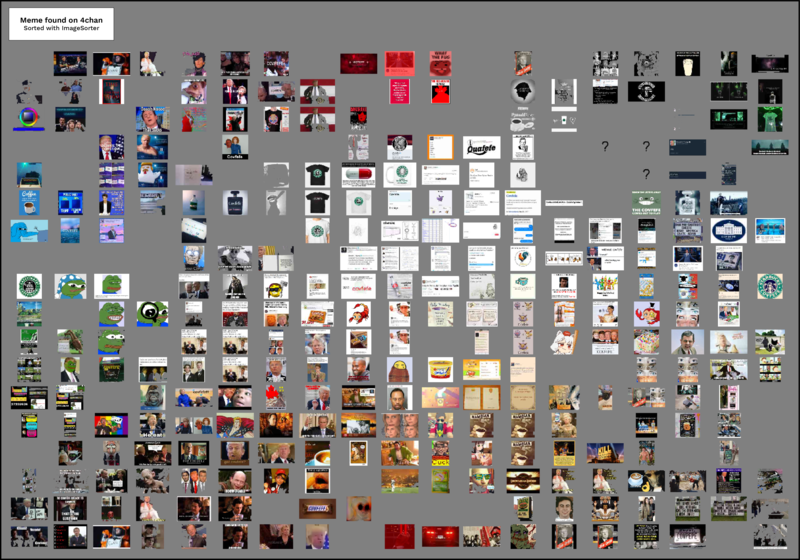 Sortering the memes, using ImageSorter, four categories or memetypes appeared: fake screenshots, photos of a humans overlaid with text, logo-based memes, projected or printed on mugs, t-shirts or billboards; cartemes. Below is a sorted view done with ImageSorter of posts with memes from Tumblr. Following that is the same view for posts from Reddit. On Tumblr we could not determine a clear political orientation for 84 percent of the posts. On reddit, we classified 79 percent of the posts with an unknown political orientation, and finally, on 4Chan it was 70 percent. The political orientation for each platform can be seen in the pie charts below. Firstly, the main flaw of our research is the limited amount of data for 4Chan, due to the problems we faced working with the 4CAT tool. Because of this, our results for 4Chan cannot be considered as significant as those for Tumblr and Reddit. Although limited in numbers, the different political angles we distinguished between 4Chan posts, show that this platform is not as one-sided in the political debate as we thought at first. Although our research method proved to be useful for finding the main differences between meme platforms when it comes to their supply of Covfefe-memes, there still remains a need for further research on Trump memes in general. However, our focus on Covfefe in particular did function as a test sample, which can be used for future research, because the word itself is a wildcard term that any meme maker can connect to any idea or opinion. Furthermore, in our visualisations with the Clarifai API and Imagesorter, we only included the images that we manually coded as “memes”. In future studies, visualitions of cartemes could be made as well. This can help the further delineation of formal and content categories. Regarding our research method in particular, one limitation was that not all the images we found using the different tools had to do with the word “covfefe” or Trump’s tweet that contained the word. The reason for this was that we chose to query for posts that contained the word itself and an image, instead of finding a way to only receive images that actually have to do with the incident. Because we did not analyze the images collected from posts in the context of their specific post or thread, it remained impossible in many cases to determine to what extent the image related to the Covfefe incident or what its political orientation was. Finally, another aspect that needs to be mentioned is the fact that we have only considered three platforms. A more wide-ranging study on meme production as a result of Trump’s political actions, and research on meme production and dissemination in general, would have to include mainstream platforms like Facebook, Twitter, Instagram and others, as well as more niche platforms such as 9GAG and 8Chan. These so-called “normie” platforms, are important hubs for meme production. Specific studies of the ‘routes’ of memes from one platform to others might be able to offer more conclusive evidence about the extent to which some platforms function primarily as production sites and others as circulation platforms for such memetic content. Given the amount and range of memes on the social media platforms we studied, and the proportion that memes form of the whole, there is a clear need to further specify and categorize memes as a broad form of cultural production. It is difficult to make such a categorization on purely formal grounds, although different genres can clearly be distinguished. We started out with the assumption that ‘carteme’ (memes containing clear cartoon elements) would be clearly distinguishable as a category separate from what we considered ‘traditional’ memes (a photo overlaid with text). While this proved to be accurate, it became clear that there are more subcategories of memes that should be distinguished. By arranging them according to color using ImageSorter, we could clearly see four categories, which we recognized as the following: fake screenshots; image of a human overlaid with text; logo-based memes, projected or printed on mugs, t-shirts or billboards; cartemes). These four categories left few individual cases of doubt (i.e. memes that would fall into none of the categories, or into two or more categories). No categorization of the large and raucous body of memetic content can be definitive or exhaustive, and other groupings of course remain possible, but as an initial categorization based on formal qualities (color, and clearly distinguishable basic traits) this one seems productive. This was further affirmed by the fact that Clarifai, which assigns content tags to images it analyzes, also offered a network of image tags which shows clear clusters of the same categories. 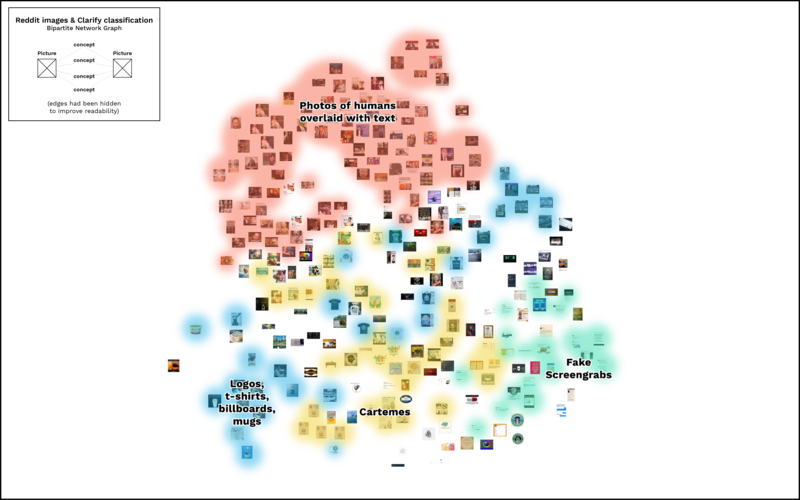 This finding, that both a human categorization and ImageSorter (color-based) and Clarifai (content tag-based), offer support for the same categorization - which also holds up across different social media platforms, each with their own preferred meme types - suggests that the categorization is robust. Furthermore, the study of the “covfefe” case, despite its limitations, strengthens support for our hypothesis that Trump tweets meme fodder, material that invites meme-ification. In the current social media ecosystem, which hybridizes roles such as consumer and creator, memes, particularly cartemes take the place of what used to be political cartoons, though they have acquired new functions and a new place vis-a-vis the person potentially ridiculed. Hoffa, Felipe (2019). “fh-bigquery” Google Big Query. https://Bigquery.cloud.google.com. Computer software. Shifman, Limor. (2013). Memes in digital culture. MIT Press. Weltevrede, Esther (2008). Harvester. Computer software.